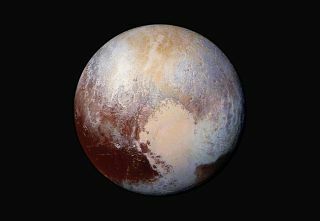 NASA's New Horizons spacecraft captured this stunning false-color image of Pluto on July 14, 2015. For example, the new study, which came out online today (Oct. 15) in the journal Science, reports the discovery of Norgay Montes and Hillary Montes, the water-ice mountain ranges on Pluto that rise 1.2 miles to 1.9 miles (2 to 3 km) above surrounding terrain, as well as other, lower peaks. NASA's New Horizons probe captured this high-resolution, enhanced-color view of Pluto's largest moon Charon on July 14, 2015.